Yesterday the QuickLearn Training team got together to host a webinar for other members of the integration community to reflect on a few of the new features in BizTalk Server 2016. Rather than trying to cram all of the features into a 1 hour webinar. We focused on three of the new features and explored the fun implications of each. If you missed it, you can find it on the QuickLearn Training YouTube channel. We will be releasing detailed write-ups of each of these topics in the coming weeks. This was just part one of a series of Webinars that we are planning. Keep an eye out for more details on the next webinar via our Twitter account. This blog is usually reserved for technical posts and QuickLearn Training announcements, but something happened across my Facebook feed a while back and I’ve found myself revisiting it in my mind over and over so I have some thoughts / predictions / musings that I want to express. I’ve been training people how to be BizTalk Server developers and administrators since 2005. That’s a pretty long time; and in that time I’ve hit the job market looking for a new position on only a couple of occasions because I really love my job. But I know that I’m one of the lucky ones. There are plenty of people out there looking to advance their careers. Others who hate the company they work for. Plenty of people feel stuck in dead-end positions. And there’s definitely a few looking to completely start over. This brings me to my point. 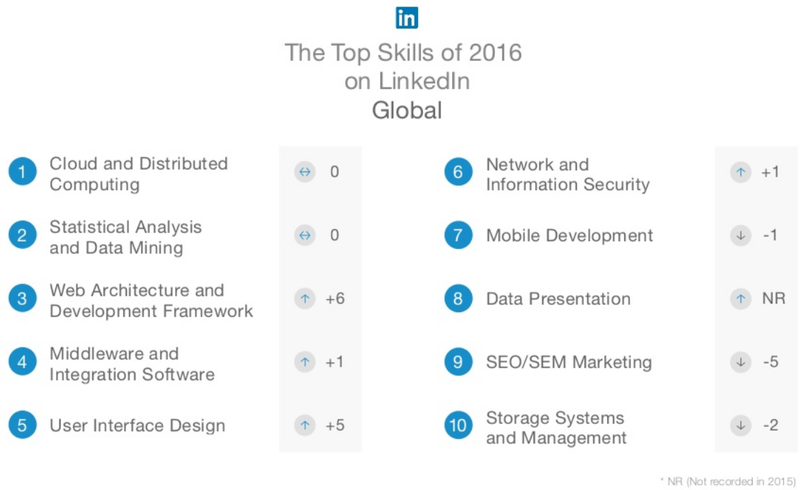 If any of that sounds like you, or someone you know, check out LinkedIn’s “Top Skills That Can Get You Hired in 2017” blog post (this is the thing that I saw on my Facebook feed). 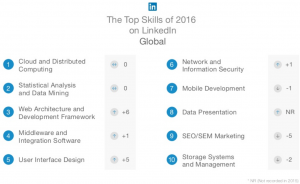 In it they list the top 10 skills based on the jobs listed on LinkedIn in 2016. Of course, as someone who specializes in integration, I was pleased as punch to see Middleware and Integration Software in the #4 spot globally. Furthermore, Cloud and Distributed Computing is in the #1 spot (not surprising). Naturally I couldn’t help but think of Logic Apps since it’s the convergence of those two categories. Logic Apps are in a position to change the game for a lot of organizations and people. I think we’re going to see a dramatic increase in the number of organizations / development teams looking for “cloud” developers with an integration background. Just because that flashy new cloud-based integration platform comes rolling down the street doesn’t mean I’ve forgotten about BizTalk Server (my first love). Microsoft has increased their investment in BizTalk Server over the past 2 years, and just released BizTalk Server 2016 (I’m still waiting for Nick Hauenstein to start writing about all the new features). In the past year, Microsoft has changed its tune regarding Azure. The new buzzword is Hybrid. I don’t want to dismiss that as a buzzword though. Hybrid (or more specifically, Hybrid Integration) is blending new Azure or cloud-based systems with existing on-premises systems. No one is going to abandon all of their on-premises investments overnight to adopt a cloud platform. The companies that are moving to the cloud are doing so slowly and deliberately one system / project at a time. No one is saying “Pack everything up Ted, we’re moving to the cloud.” Instead cloud services are used for new development. As more workloads start running in the cloud, organizations need skilled people to connect those cloud services to data and services that live on-premises. BizTalk Server is a prime candidate to be your hybrid integration platform. Gartner estimates that by 2020, 75% of large organizations will have a hybrid integration platform. Those companies are going to need savvy integration professionals to build those platforms. Our world seems to get more connected day-by-day. Mobile apps and IoT (Internet of Things) have changed the way people live their lives and neither is fading away any time soon. Oh yeah, I almost forgot to mention that in the LinkedIn article, Mobile Development holds the #7 spot. That Gartner report I referenced a second ago states that 70% of mobile app development costs are related to integration and that integration represents 50% of the cost in IoT solutions. You know that all these systems don’t magically connect to each other. Someone has to build those connections, and that someone could be you. That sea-change the cloud was supposed to bring… it’s here. Companies have started adopting cloud technologies and they aren’t going to stop. As integration professionals, we are in a unique position to capitalize on this change. But with the demand as high as it is, you’re going to have to stand out. If your skills included integration (on-premises and cloud) + cloud development + mobile development, you’d be poised to land some of the most coveted jobs. I didn’t intend for this to be a sales pitch, but if you need help getting there, QuickLearn Training can help you out. Our courses on BizTalk Server (updated for BizTalk Server 2016 starting in January 2017) and our Cloud-Based Integration Using Azure Logic Apps course will equip you with the deep skills you need to become the elusive unicorn that companies are looking for. On the other side of the coin, if you’re looking to get some unicorns on your team, they are hard to find and will come at a cost. Honestly, you’re probably better off making your own unicorn. Time and again I hear from customers about horror stories where they hired someone who wasn’t a good fit. Or the consultant they contracted with disappeared and now they are stuck without support. I genuinely think the best option for most teams or organizations is to find the person you want and then help them gain the skills you need. I’m not boasting when I say that I’ve had more than a handful of students tell me that my course(s) helped them find a direction for their career; if anything it is a rather humbling experience to realize that you have played a role in changing their lives. As a trainer, I love that my job is to make other people’s lives better, and I’d like to help make yours better too. I know that I speak for everyone here at QuickLearn Training when I say, make 2017 awesome by becoming a unicorn!